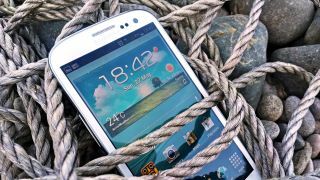 A single line of code that could force some TouchWiz Samsung handsets to factory reset has been discovered, affecting a range of handsets including the Galaxy S3. It looks as though it's TouchWiz that allows the code to do its business automatically, with vanilla Android seemingly showing the code in the dialer screen without automatically running it. Encoding the code in a seemingly innocent NFC tag or QR code could see Samsung users unwittingly wiping their handsets because as soon as the phone deciphers it, there's no stopping the factory reset. Frustratingly, users can see the reset process kicking in but neither hitting back nor any other command will stop it. Apparently the code can also be used to destroy the SIM card too. Although there's no evidence that anyone is using this powerful line of code to mess with people's Samsung phones (yet), the level of attention in the tech media means that some nefarious types may start. Samsung is currently investigating the issue; we'll let you know as soon as we know more from the company.